After adolescence in North Yorkshire, and an early art college training in Harrogate David Clapham was accepted at the Slade School in London in 1959, and enjoyed a unique education under the guidance of Professor William Coldstream and William Townsend. London at that time was a hotbed of new ideas in the arts and the advent of pop culture contrasted strongly with the figurative traditions of the Slade School. This encouraged a re-evaluation of objective painting and sculpture, and what emerged in the work of Michael Andrews, Euan Uglow, Leonard McComb, Anthony Gormley and Paula Rego stems from this new Slade philosophy. While at the Slade, Clapham worked in both painting and sculpture working largely from life, later experimentation with abstract expressionism was strongly influenced by the American Exhibitions held in the early sixties at the Tate. In 1961 he was awarded a travelling scholarship, and stayed in Paris, later moving south to live near the Mediterranean in Colliouer, and later Banyuls, the birthplace of Maillol, and unbeknown to Clapham at the time once a favourite haunt of Matisse and Derain. After returning to England, he lived and worked in London and supported himself with casual work at the BBC and later the theatre, returning to post-graduate studies at Bradford College of Art in 1964 and exhibiting at the Spring Exhibition in 1965. In that same year, he was appointed as a lecturer in Fine Art at Wolverhampton Polytechnic, and then in 1967 moved to Liverpool College of Art to teach painting. Here he made a notable contribution in the development of "˜new media' by including film and moving image into the Fine Art vocabulary. While still painting and exhibiting, he established an Art Gallery, and was a founder member of a studio complex in Liverpool, that included among others Anish Kapoor, Ian McKeever, Adrian Henri, and Maurice Cockrill as resident artists. While working as a Fine Art lecturer, Clapham developed a successful twenty-year relationship with mainstream television eventually moving into documentary film making full-time in 1989 frustrated with the increasing bureaucracy of Art Education. Between the years of 1980-2004, David Clapham worked in broadcast and corporate television productions for companies in Italy, Spain, USA, and received several broadcast commissions from Granada TV. His work has been shown on BBC, ITV, Channel 4, SUD Channel-Spain, TV4 Sweden, TV2 Norway, NOS Holland, ORF Austria, SABC South Africa, and TV2 Denmark, and more recently camerawork for Slinky Pictures for their Bafta nominated "˜Dads Dead' a groundbreaking live-action animation film, winner of the 2004 British Animation Award. 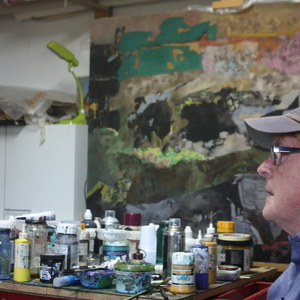 David Clapham's work has moved full circle back to the painter's studio within the last five years. His collection of work shows the culmination of a career of visual experiment and in particular the ongoing challenge of combining new media with the painters art. As a reoccurring image the flooded fields of Buckinghamshire are manipulated using digital techniques to incorporate images from other influences. The resultant paintings have a "˜time-warp' quality about them making one observer comment that a glimpse has been caught of another dimension in time or place. These images have developed over a period of several years and are as much about the mood and changes of light that occur in the landscape as the computer generated means of their reproduction. The constant re-printing and re-scaling, worked from the numerous versions of the same image result in an amalgamation of thought and time contiguous with the changing appearance of landscape. The time and labour involved in reworking of the image allows for the assimilation of influences from previous paintings, drawings, videos and the observations of Jung, Freud and Klein. The variations of exposure and print quality add a random element to the process, creating possibilities for the observer to catch a trace of another dimension in the finished work. Clapham's paintings have a vivid identity that owes as much to the latent associations of a childhood spent roaming the countryside of North Yorkshire, the influences of Bacon, Rauschenberg and de Kooning in the sixties, as to his life experiences that include the highlands of Kazakhstan, filming on the gale swept Atlantic ocean, and hanging out with pagans in Golden Gate Park.